Holiday Inn Express - Yorkton, SK - VJ Management Inc. The new Holiday Inn Express & Suites Yorkton is the perfect blend of value and convenient location. We are located near highways 9, 10 and 16 and one block from downtown Yorkton, where you can enjoy shopping at the mall and explore popular dining options, coffee shops and entertainment areas such as Tower Theater, Gallagher Centre, home of the Yorkton Terriers and the Painted Hand Casino. 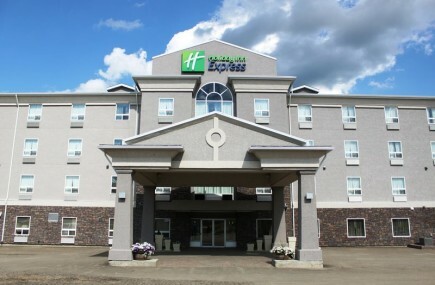 The Holiday Inn Express Hotel & Suites Yorkton is also located near Yorkton City Hall and other major businesses in the area such as Information Services Corporation, CTV Television, Yorkton Court House, Grain Millers Canada and Parrish and Heimbecker. Don't forget to stay fit using our 24-hour Fitness Center or make sure to relax in our indoor heated pool and hot tub. Make sure to enjoy our free hot buffet breakfast with options of scrambled eggs, omelets, bacon, sausages, French toast, pancakes and our signature cinnamon buns. We also offer free coffee in the lobby 24-hours a day. Keep yourself connected with free high-speed wireless Internet in our guest rooms and all public areas of the hotel or take advantage of our 24-hour Business Center. We also offer one meeting room and boardroom for all your business & meeting needs.